The long-awaited “He-Man” movie has a director. According to Latino Review, “Kung Fu Panda” co-director John Stevenson has landed the job. According to their sources, the former Muppet Show character designer and animation artist pitched a new take on the Mattel and cartoon character which got him the job. Stevenson has an extensive background in art direction and animation, starting out as a character designer on The Muppet Show in the late 1970’s. As if I weren’t already jealous that our UK listeners and readers get a new episode of “Doctor Who” on Christmas, now comes news that BBC 1 will air a new Wallace and Gromit special during the holiday period. The popular stop-motion animated duo will return in “A Matter Of Loaf And Death”. The pair open a bakery — Top Bun — only to find a ‘cereal killer’ is targeting all bakers in town. 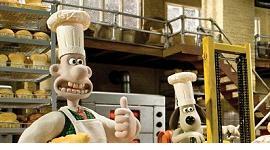 As Wallace is busy wooing a new love interest, Piella Bakewell, it is left to Gromit — who doesn’t speak — to uncover the killer. Universal Pictures is remaking yet another Japanese horror flick for American audiences. This time it’s “The Host” Variety reports. Not to be confused with the best-selling Stephenie Meyer novel of the same title, the original movie followed a city terrorized by a giant mutant squidlike creature hatched by toxins that flow into a nearby river from a military base. When the creature grabs a little girl, her dysfunctional family must band together to rescue her. Fredrik Bond is set to make his directoral debut with the movie and Mark Poirier is adapting the script. Viewers are not flocking back to “Heroes” as NBC had hoped. With the termination of two writers, NBC hoped to send a message to fans that they were trying to get the show back on track creatively. Apparently the fans aren’t interested if the latest ratings are any indication. “Heroes” finished a distant fourth in the Monday at 9 p.m. time slot this week, beating out only Fox’s “Prison Break” and the CW’s “One Tree Hill.” “Heroes” dropped two percent of its previous low that it put up last week. The show earned a 4.6 share Monday evening. Ratings are down 25 percent for the series since the season premiere. I think you’ll find that ‘The Host’ is Korean not Japanese, Michael. Aren’t the Koreans making a sequel?